Quint: Japanese submarine slammed two torpedoes into our side, Chief. We was comin' back from the island of Tinian to Leyte... just delivered the bomb. The Hiroshima bomb. Eleven hundred men went into the water. Vessel went down in 12 minutes. Didn't see the first shark for about a half an hour. Tiger. 13-footer. You know how you know that when you're in the water, Chief? You tell by looking from the dorsal to the tail fin. What we didn't know, was our bomb mission had been so secret, no distress signal had been sent. They didn't even list us overdue for a week. Very first light, Chief, sharks come cruisin', so we formed ourselves into tight groups. You know, it was kinda like old squares in the battle like you see in the calendar named "The Battle of Waterloo" and the idea was: shark comes to the nearest man, that man he starts poundin' and hollerin' and screamin' and sometimes the shark will go away... but sometimes he wouldn't go away. Sometimes that shark he looks right into ya. Right into your eyes. And, you know, the thing about a shark... he's got lifeless eyes. Black eyes. Like a doll's eyes. When he comes at ya, doesn't seem to be living... until he bites ya, and those black eyes roll over white and then... ah then you hear that terrible high-pitched screamin'. The ocean turns red, and despite all the poundin' and the hollerin', they all come in and they... rip you to pieces. You know by the end of that first dawn, lost a hundred men. I don't know how many sharks, maybe a thousand. I know how many men, they averaged six an hour. On Thursday morning, Chief, I bumped into a friend of mine, Herbie Robinson from Cleveland. Baseball player. Boatswain's mate. I thought he was asleep. I reached over to wake him up. He bobbed up, down in the water just like a kinda top. Upended. Well, he'd been bitten in half below the waist. Noon, the fifth day, Mr. Hooper, a Lockheed Ventura saw us. He swung in low and he saw us... he was a young pilot, a lot younger than Mr. Hooper. Anyway, he saw us and he come in low and three hours later a big fat PBY comes down and starts to pick us up. You know that was the time I was most frightened... waitin' for my turn. I'll never put on a lifejacket again. So, eleven hundred men went in the water; 316 men come out and the sharks took the rest, June the 29th, 1945. Anyway, we delivered the bomb. Quint: Here lies the body of Mary Lee; died at the age of a hundred and three. For fifteen years she kept her virginity; not a bad record for this vicinity. 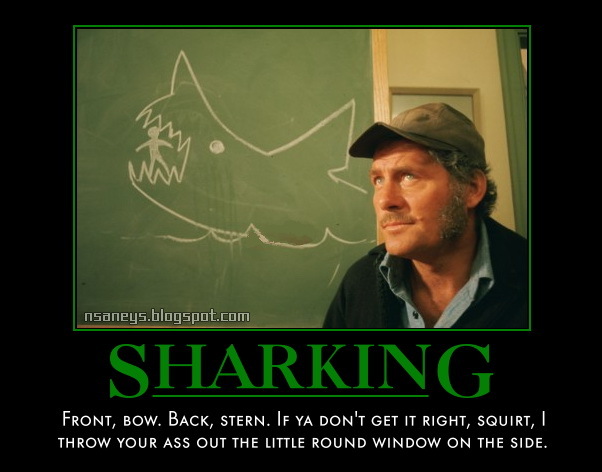 Hooper: Quint, that doesn't prove a damn thing! Quint: Well it proves one thing, Mr. Hooper. It proves that you wealthy college boys don't have the education enough to admit when you're wrong.